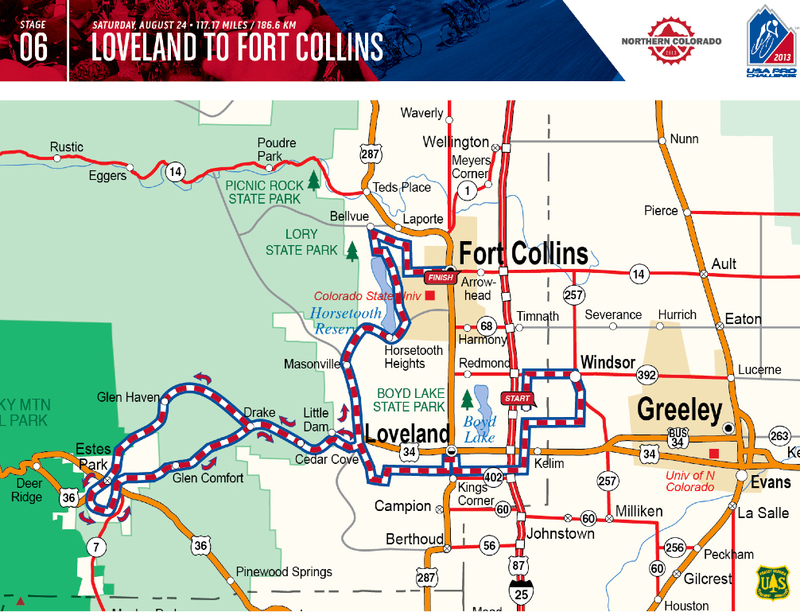 There is a first for everything and this year the USA Pro Challenge heads north of Denver to the towns of Loveland and Fort Collins. Loveland sits at the base of a cycling paradise and Fort Collins, a University town, is home to one of the key Partners (Sponsors) of the race - New Belgium brewery. I like old Belgium, so I certainly like New Belgium. 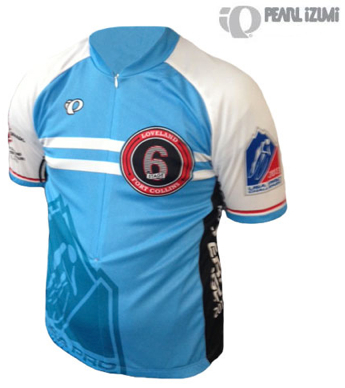 This route takes riders from the plains to the mountains and back. A big day for the climbers, who will climb along a river and through pine forests to reach Estes Park. The town of Estes Park is the gateway to Rocky Mountain National Park, a 265,761 acres (107,550 ha) park with 359 miles (578km) of trails, 150 lakes, and 450 miles (720km) of streams. 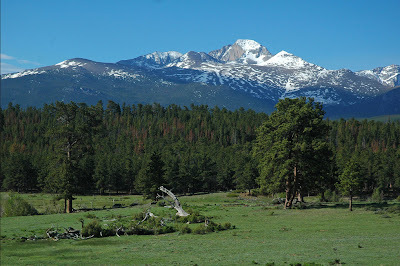 The park contains 72 named peaks higher than 12,000 feet (3,700m), and over one-fourth of the park resides above tree line. 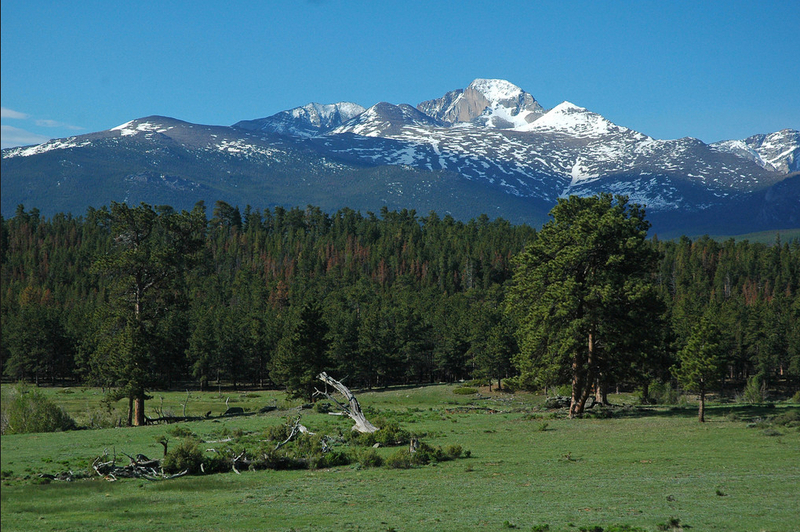 Colorado's National Park receives over 3 million visitors a year. The pro riders will climb 11,855ft in Stage 6 - the penultimate stage - of the 2013 USA Pro Cycling Challenge. 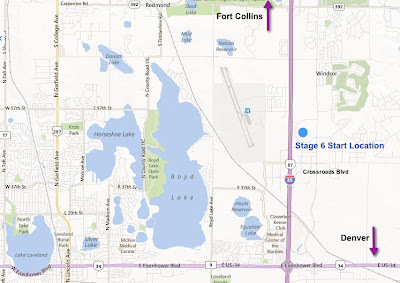 For information about the Stage finish in Fort Collins, please go to: USA Pro Challenge in Fort Collins, By Pedal Dancer®. Loveland and Fort Collins - from the plains to the mountains and back. 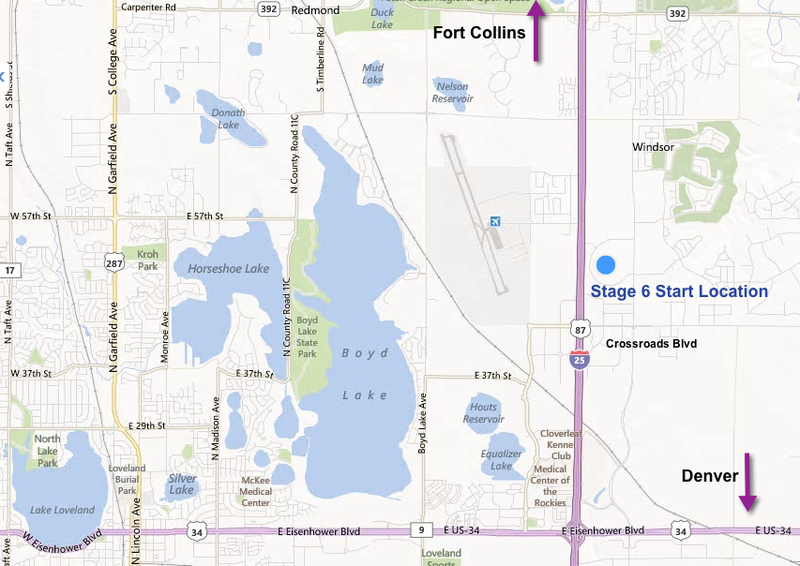 Stage Finish - Fort Collins: 4:15pm approx. This stage clearly has something for everyone - in fact, it might just have too much. Fans can easily drive or bike from the start area at The Ranch Events Complex in Loveland to the finish area in downtown Fort Collins in time to see the finish. 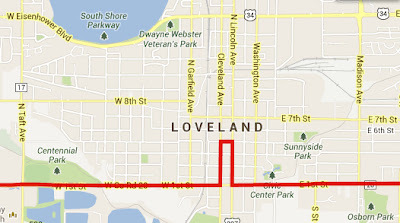 Fans can also get from downtown Loveland to the finish area in downtown Fort Collins. 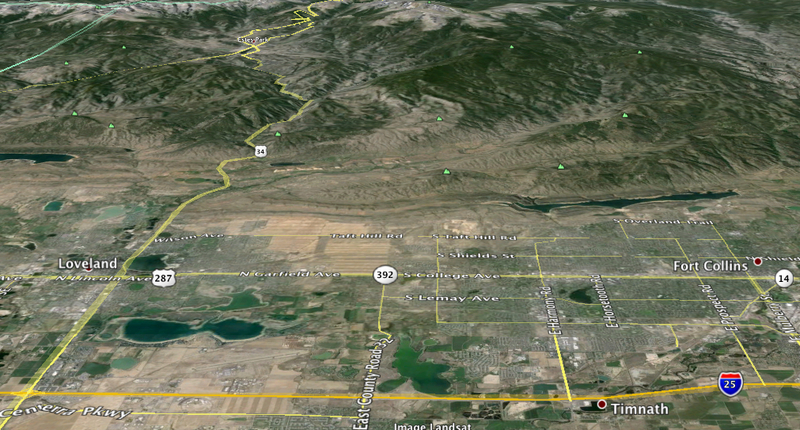 Fans will not have time to travel from Horsetooth Reservoir to downtown in time to see the finish. 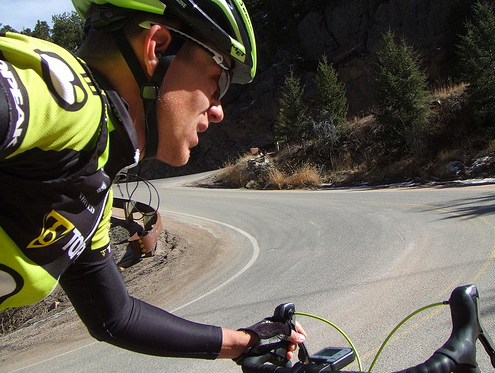 Fans who see the race in Estes Park should just stay there and enjoy the lap around town. Local business, New Belgium, is the stage sponsor for Stage 6. For this stage you have the option to enjoy the city activities before and in between watching the start and finish of the race. Or you could try to see the riders in the spots where they will pass more than once: Downtown Loveland (Lincoln & Cleveland Streets); the junction of 34 and 29; Elkhorn and St Vrain Avenues in Estes Park; in the town of Drake. There are plenty of homes and businesses along this route so it might be nice to just stay local. Road closures and traffic control will be a major task in this populated area. For road closure information read: All Colorado Road Closures for the 2013 USA Pro Challenge Bike Race. Those at the Start: will be able to make it to the finish. It may be too tight to make it from the start to downtown Loveland. The riders will be covering 20 miles, and you will have to wait for the road to reopen (road in and out close around 11:15am near the fairgrounds), you could just make it in time, or miss it. If you want to be at the start for a short bit and then drive up Big Thomspon, leave the start by 11:00am. In and out closes at 11:15 near the Fairgrounds and the road up Big Thomspson closes at 12:00pm. 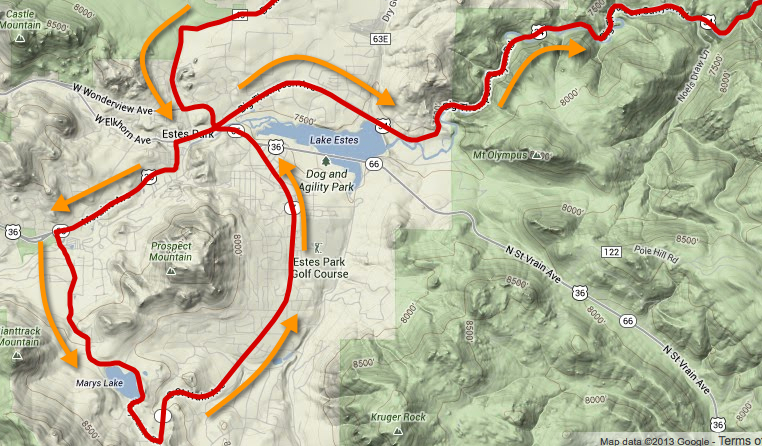 If you are at the start, you can make it to Horsetooth Reservoir if you avoid the juncture of SH 4 and N Co Rd 27. It is best to approach the res from the east. If you are at the start you can easily drive or bike to the finish. 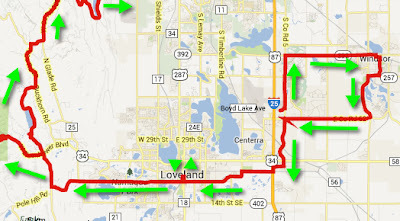 Those at Loveland downtown: can easily bike or ride to Horsetooth Reservoir, approaching from the east. You can also bike or drive to downtown Fort Collins for the Finish. Those in Estes Park area, or Glen Haven: should enjoy the day there. Those at Horsetooth Reservoir: Can see the start in the morning, but will not be able to make it by bike or car to the finish line in time. Boulder Cyclists can ride to Estes Park via Hwy 7 where they could watch the lap around Estes Park at the sprint points line or descend to Devils Gulch to watch the KOM point. Other cyclists might want to ride up Big Thompson Canyon in the early morning to watch the riders pass by twice in the town of Drake (once up and once down). Remember the steeper the slope - the slower the riders, although these riders are never really slow. Glen Haven switchbacks. Photo by Jeff Kerkove. I would be interested in riding or driving up Big Thompson to Drake or continuing to Glen Haven to watch the riders. I have done this ride and remember the switchbacks being STEEP. Here are some photos of the area on a blog post by local mountain biker Jeff Kerkove: Throttled (although I've never seen someone take a back video of their legs while riding, maybe it was to prove to his coach he really was riding it). 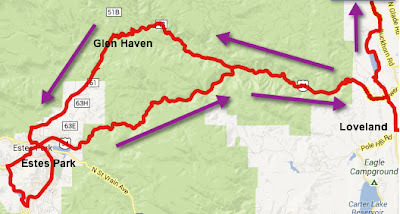 Personally I think the switchbacks and Devil's Gulch outside of Glen Haven would be an awesome place to watch the race. You could ride up to Glen Haven in the morning to watch the pro riders on their climb to Estes Park, then descend to the town of Drake and catch the riders as they pass by again in a reverse direction back down Big Thompson on their way to Horesetooth reservoir and the finish in Fort Collins. You will be able to descend from Drake once Course Marshals open the road to cyclists. Horsetooth reservoir could also be a good place to ride and watch the riders, but don't expect to be able to descend into town to catch the finish or podium awards, the riders are much faster than you having to deal with traffic and parking in an anticipated already crowded downtown Fort Collins. 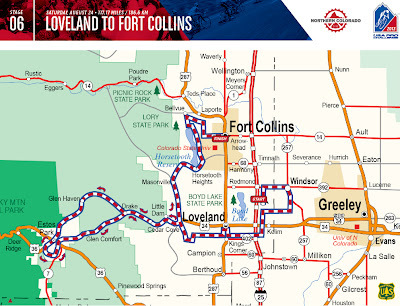 Alternatively you could do some town riding between the start and finish area, or between downtown Loveland and downtown Fort Collins. Seeing the riders twice in the day. For this I would go no-lycra and just wear your casual around town clothes, it'll be a long warm day. *Remember, it often rains in Colorado in the afternoons between 1pm-4pm, be prepared. Full road closure details for the Loveland and Fort Collins area: All Colorado Road Closures for the 2013 USA Pro Challenge Bike Race. Also read local road closures. * Portions of Old Town FC, and Horsetooth Reservoir close Friday night. Volunteers are needed on August 24, 2013: Read more, or sign-up or local volunteer sign-up. Gathering near the Team buses at the Ranch Events Complex in Loveland on Saturday morning should be fun. Start areas are good for families and avid cycling fans. Team buses and mechanic trailers are the place to see the bikes close up. You will likely only see the riders briefly at the team buses when they exit to mount their bikes and head to the start-line, this stage allows the riders to warm up on route. One tip is to look for Bob Roll or other interviewers, because the riders will come out of their bus or RV and offer interviews pre-race. The sign-in stage at the start area (or nearby it to watch the riders freely riding by) is a fun location for good rider viewing and to hear the pre-race interviews by the race announcers on stage. Autograph Alley next to the sign-in stage is the place to collect more rider autographs. Another good viewing location should be in downtown Loveland. The corner of 4th Street and Lincoln Ave is the location of the 2nd sprint of the stage. If you are near 1st Street you will be able to see the riders pass by twice, up N. Lincoln Ave to 4th St and down Cleveland Ave turning west of 1st St. My solid guess is you will not be able to cross over the course so be on one side or the other before the riders take the first corner and then join the crowd running west to see them pass again (map above). The steep section on route near Glen Haven, with it's the famous steep “Devil’s Gulch” with an average 8.5% grade, or the max grade of 12.5% switchbacks nearby would be a great place to be on race day. This is the point where the riders will be going their slowest on the stage. Any downhill sections will see very high speeds. Estes Park will have visitors who probably got stuck on vacation when a bike race happened to hit town, but this could also be a good place for cyclists wanting to ride themselves to a KOM point on course. 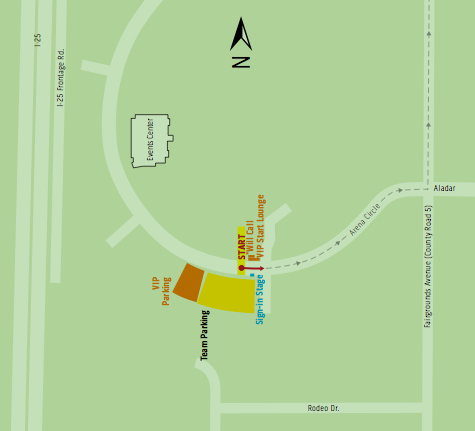 Fort Collins downtown will be hopping, so should City Park located on Mulberry and Taft Hill. 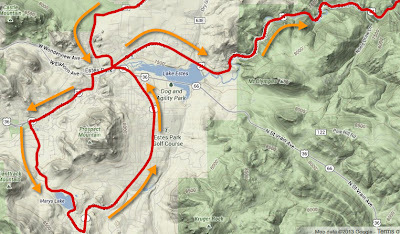 The route passes up and down Loveland before continuing along 1st St. west to Estes Park. 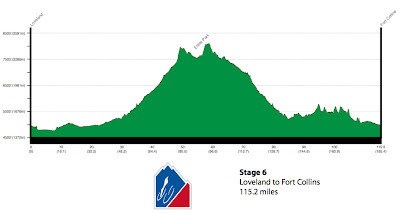 Other PEDAL DANCER FAN GUIDES - USA Pro Challenge city event guides, route maps, road closures, and stage start and finish times.